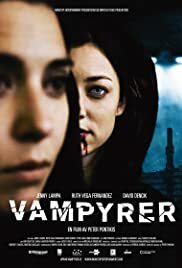 In this terse indie effort by Peter Pontikis, Vera (Jenny Lampa) and Vanja (Ruth Vega Fernandez) are two sisters in a Swedish city who share a secret; they are vampires, although far from the kind we've become accustomed to in this age of "Twilight" and "True Blood." We do not find out much about them but are plunged straight into the story--on an evening when Vanja has promised to reveal a major life decision to Vera, a biker gang leader tries to molest Vera in a nightclub toilet and she kills him, sucking his blood. The sisters must run and try to stay one step ahead of the vengeful bikers, until a fateful confrontation. Everything about the story is brief and understated. These vampires do not appear to be undead, have no super-powers--not even fangs--and are as vulnerable as anyone else. The fact that they live on human blood seems to be the only real difference between them and ordinary mortals, but that simply emphasizes HOW different that one thing makes them. The locations are all real due to the low budget; rain, wind, etc., are all real and give this film a very immediate impact. The story leaves behind a simple, poignant feeling. Look out for an appearance by David Dencik, familiar from "Forbrydelsen," both "Girl With The Dragon Tattoo" movies, and "Those Who Kill." The acting from both principals is excellent, and I give it a 9 only because of a few scripting decisions I don't agree with artistically. Still, one of the best films I've seen in a few years.